Monday. What to do with these Mondays of ours? If you’re a pastor or ministry leader, I know that Mondays for you can be a mixed bag. You may be still glowing from yesterday’s victories — high attendance, vibrant worship, the well-preached sermon and ensuing compliments. Or you might be still smarting from yesterday’s wounds — struggling ministry, sluggish praise, the feeling of not quite delivering that hoped-for homiletical fire. Maybe you’ve heard one complaint too many, too much grumbling. The loyal opposition continues to gossip and nitpick. Maybe your wife or kids are unhappy. Maybe you don’t know how to ask the church’s “powers that be” to help you afford to pay your bills. Or maybe you’re just in a funk, feeling like you’re spinning your wheels and not sure why what you’re doing matters. Pastors, there is hope for you. The Lord of our God is unrelentingly for you. His affection for you and his approval of you are in no way contingent on you “hitting one out of the park.” His thoughts about you are not shaped by your ministry achievements or lack thereof. He has not gathered his Trinitarian self into the heavenly war room to troubleshoot you. No, God is not a fan of yours. He’s not a fan of yours, because fans are fickle and turn on you when they get disappointed. Fans tie their feelings to performance. God is not a fan. He’s a friend. You can’t disappoint him, because you can’t surprise him. He sees your bad sermons coming. He has numbered all your days, including your days of feeling a little “off,” before the foundation of the world. He is not put off by your critics and he is not puffed up by your yes-men. He is the great I AM: He is that he is. And he approves of you eternally by the blood of Christ applied to the doorpost of your heart — and to the doorpost of your ministry. So there is water for you today, whether you push through on these difficult Mondays in the quiet of your study or the busyness of the visitation route or whether you take these Mondays off to recuperate at home. 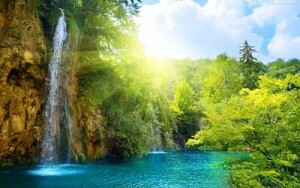 There is water for you at every moment, living water flowing freely from the pierced bosom of Christ. It is water to satisfy your thirsty soul, water to heal your ministry wounds, water to cool your heels, water to cheer your “Monday face.” Don’t look for it anywhere but in Jesus. Monday. What a great day to come tired and burdened to Jesus and let him help you.